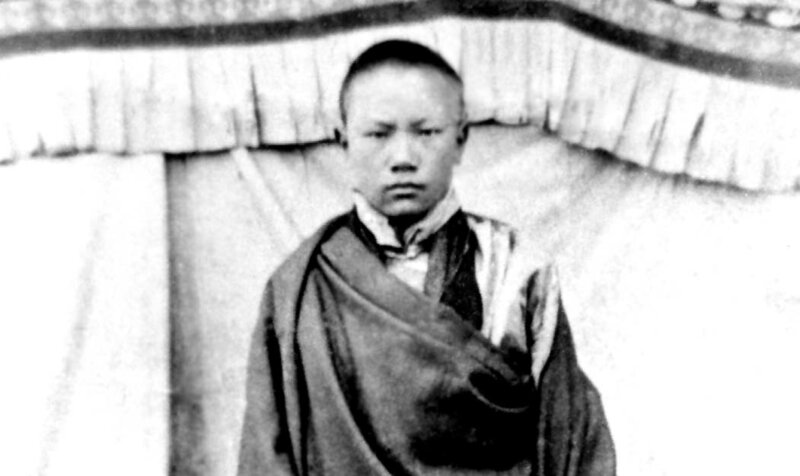 During Karmapa’s youth in Tibet, traveling on the “Roof of the World” was no easy task. Until the first jeeps appeared in the 1950s, Yishin Norbu journeyed either on horseback or in a palanquin. Like previous Karmapas, he often spent weeks or months traveling in order to perform his dharma activity and visit students throughout the country. To make good use of this time, he traveled in what was called the Garchen, “the Great Encampment of the Karmapa,” a highly organized community of practitioners who accompanied the Karmapa on his journeys. The 4th Karmapa had established the traveling Garchen, and Khenpo Karthar tells us that the Garchen “was a principal element in the Karmapa’s activity during several lifetimes.” The 4th through the 9th Karmapas spent the major part of their adult lives in the Garchen, accompanied by a moving Dharma community of hundreds or even thousands of followers, who wished to benefit from his continual presence and blessing. Admission requirements were rigorous. Either one would have completed the preliminary practices (Tib. Ngöndro) or would have recited a substantial number of Mani mantras. All camp members agreed to consecrate the “four sessions” of the day to different aspects of Dharma practice. The Garchen contained separate sections. Each practitioner in the retreat section lived in an individual tent, just large enough to sit in. At its peak, the Garchen contained up to five hundred practitioners who maintained the discipline of a meditation retreat. The art section included thangka painters of the famous Karma Gardri tradition, which took its name from the Garchen. A Shedra (monastic university) and a Tantric College were also included. Consumption of meat and liquor was forbidden in the Garchen. In its heyday during the lifetime of the Seventh Karmapa Chödrak Gyamtso (1454-1505), it became a veritable tent city, accommodating many thousands of people. Five hundred mules carried the camp’s luggage, which included an extensive library. Given its size, the camp was often divided into smaller sections. This was especially needed for passing through poorer nomadic regions, where the local people couldn’t have coped with the entire Garchen’s needs. The Kagyü Mönlam, an annual prayer festival founded by Chödrak Gyamtso, was also held at the Great Encampment. In the 17th century, Lhasa’s new rulers suspected the camp of collaborating with the King of Tsang, and consequently their allies, Gushri Khan’s Mongol troops, attacked the Garchen. Sadly, many practitioners were slaughtered. As already mentioned, the 10th Karmapa himself fled; according to legend, he flew to Yunnan in the south of today’s China, spending decades in exile. Later Karmapas re-established the camp, and the members continued to increase until in 16th Karmapa’s youth they again numbered about a thousand practitioners. This passage is based on the following sources: Mendong Tshampa Rinpoche Ngaydon Tenjay, in: Khenpo Karthar Rinpoche; Lama Yeshe Gyamtso (transl. ): The Lives of the Karmapas, KTD Pubs. (in preparation. ); Tulku Urgyen Rinpoche: Blazing Splendor, op. cit., p. 146; Karma Trinlay Rinpoche: The 37 Practices of a Bodhisattva, Nov 2003 KIBI; Lhundup Damchö (Diana Finnegan) et al. : Karmapa: 900 Years, KTD Pubs. 2011; Situ Chokyi Jungnay and Belo Tsewang Kunkhyab: The Garland of Moon Water Crystal; Khenpo Karthar Rinpoche, Lama Yeshe Gyamtso (transl. ): Karma Chagme’s Mountain Dharma, Volume Four, KTD Pubs 2010, p. 79. Dawn, morning, afternoon and evening.